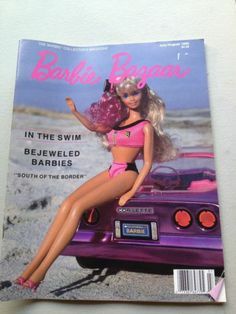 Barbie Bazaar was a magazine for Barbie collectors that premiered in 1988. The last issue was in May 2006. Below is a list of the issues. WHERE DID YOU GET THAT HAIR? An Exclusive Interview With Bob Mackie! A sneak peek at 1994 Barbie dolls! Price Guide after page 66! Mattel reIssues 1959 Barbie Doll! Nostalgic products in Hot Line! Price Guide fter page 70! Price Guide after page 70! Judy Schizas Celebrates 20 Years as Mattel's Doll Specialist! Turn to HOT LINE for the latest 1995 dolls! One Doll's Life in the Skies! dolls, costumes & more. Plus Christmas decorating tips. FAO Schwarz exclusives start on page 26! Beautiful Bride and other dazzling vintage Barbie bridal fashions! Here Comes The American Girl! Turn To Page 28 For MORE Of The HOT New Barbie Line! Vintage + Foreign Dolls, Fashions & Licensed—Midge, Mod, Skipper & More! Turn to Page 28 for 11 pages of HOT New Barbie Dolls! Celebrate 10 years of "Barbie Bazaar"
Barbie's Turning 40—Where's the Market Heading? Enter & Win! 40 Vera Wang Barbie Dolls will be given away. Details inside! The One & Only Renée Coughlan! Make your own BB Fashion Model Doll & First Outfit! Discover the Barbie Collector's Club! Barbie dolls by Stella McCartney, Emanuel Ungaro, Giorgio Armani, Vivienne Westwood, & More! Summer's Here & It's HAUTE Inside! Designed the 1999 Life Ball Barbie. Here's his story. Agnes B., Cacharel, Jacques Fath, Louis Feraud, Hermés, Kenzo, Lanvin, Guy Laroche, Hanae Mori, Thierry Mugler, Paco Rabanne, Sonia Rykiel & 23 others. New Dolls, Patterns, Crafts & Contest Winners! Vintage dolls & costumes as you've never seen them before! Barbie Pays Homage to The Act of Caring! Take A Sneak Peek at New Dolls on Page 49! 40th Anniversary of "Solo in the Spotlight"
Barbara Eden Talks About "Jeannie"
Look Out 4 These Code Breakers! Knock, knock...23 Dressed Number One Barbie dolls are at your door!